I recently noticed that because we use no ratings system on our reviews (we just speak our minds without assigning a numerical value), there is no easy way to see the candy that we have reviewed that we felt is the cream of the crop. 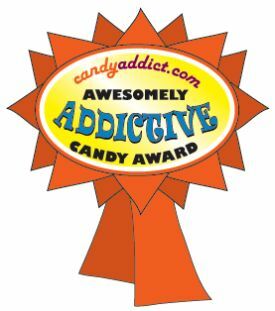 To combat this, we have created the “CandyAddict.com Awesomely Addictive Candy Award” (Hmmmm…I just realized the acronym is CAAACA – maybe I need to rethink this) and the Awesomely Addictive category. This award will be given only to the candy that we feel is the absolute best of the best and will not be given out haphazardly. I went through all the old reviews (all 90+ of them) and assigned the best ones to the Awesomely Addictive category – the total was 13 awesomely addictive candies. So, in the future, you can always tell which candies are reviewed highly by looking for the Awesomely Addictive (hmmm – that’s AA) logo and noting whether or not it’s in the “Awesomely Addictive” category. Also, candy companies can proudly display the logo on their website and know that they are part of an elite group. Oh – and props go to my sister for the awesome award design. Thanks, sis! Candy Addict is Three Years Old! Your welcome! And thank YOU for all the candy knowledge and samples!